Doctoral studies, under Edward Yarnold SJ and Rowan Williams. 1988-1989: as part of doctoral studies, I attended the one year course on St John of the Cross at the Centro Internacional Sanjuanista, Avila, Spain. 1993-1996: member of Provincial Council. 1994-1996: Carmelite house of studies, Dublin, as prior. 1996-2000: Carmelite priory, Oxford: novice master. 2000 Summer – 2001 Summer: renewal year in Oxford, Hartford USA, and Dublin. 2001-2005: Carmelite Priory, Barquisimeto, Venezuela, engaged in parish ministry and university chaplaincy. During this time I also spent several months working at our parish, Gerrards Cross, UK, where I had conventuality. 2005 – 2013: Carmelite Priory, Kensington, London. Parish ministry; and university chaplaincy at LSE (2005-2012) and Notre Dame, London (2013). In 2005 and 2006 I gave a one week course at CITeS on the doctrine of St John of the Cross. During 2012 I spent most of the time caring for my mother in Ipswich, who died on 1st January 2013. September 2013: Rome. A year spent learning Italian. September 2014: I joined the faculty at the Teresianum, teaching courses (in Italian): Gesù Cristo il Risorto, chiave della teologia spirituale; and courses on San Giovanni della Croce. Since 2015 I have also been teaching a course (in English) to students from Notre Dame University, Rome, Mystical Theology and the Gospel of Life. In December 2016, I read a paper at the Counselling course symposium at the Teresianum, on the Living Flame. In January 2017 I led a seminar on St John of the Cross for European OCD formators, held at Avila. I read a papera the 2do Congreso Mundial Sanjuanista-Noche Oscura, CITeS, Avila, 3-9 settembre 2018: “El Dios de la Noche”. Course for students from Rome Global Gateway, Notre Dame University: “Mystical theology and the Gospel of Life”, second semester (January to April 2018). Course on St John of the Cross for Carmelite Sisters, Italy, presso Teresianum, 11-12 settembre 2018. Corso per studenti del Collegio Interazionale su: “San Giovanni della Croce”, Salita e Notte, Teresianum 24-28 settembre 2018. San Juan de la Cruz; Santa Teresa de Jesús; Sainte Thérèse de l’Enfant Jésus; la Cristologia dogmatica e patristica. The Impact of God – soundings from St John of the Cross, Hodder and Stoughton 1995 (current edition: 2010). This has been translated into various languages. John of the Cross, seasons of prayer Teresian Press, Oxford, 2014, consisting of articles for Mount Carmel from the 1990s (see above). “Mística y Teología con San Juan de la Cruz” in La Recepción de los Místicos. Teresa de Jesús y Juan de la Cruz, Salamanca/Avila, ed. Salvador Ros, 1997, pp.507-520. Entries on St John of the Cross and on St Teresa of Avila in Leslie Houlden (ed.) Jesus in History, Thought and Culture – an Encyclopaedia, ABC Clio, 2003. “Cristo, chiave della connettività nel Cántico di San Giovanni della Croce”, in Fiamma Viva 57, ‘Tutte le creature sono connesse tra loro’ (Laudato si’ 42), Roma 2017, pp.161-177. “Visualising Christology: Llama de amor viva and the Resurrection”, in Teresianum 68/1 (2017) 87-125. “The Risen Christ, the key to Spiritual Theology” Teresianum 69/1 (2018) 85-114. 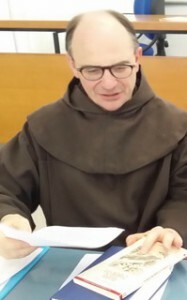 “Giovanni della Croce per i giovani?” In Giovani fede vocazione: Fiamma viva 59, Teresianum Roma, 2018, 207-217. “St Teresa and the Prayer of Offering” in St Teresa of Ávila: her writings and life ed. Terence O’Reilly, Colin Thompson, Lesley Twomey, Oxford, 2018, 124-134.